In 2015, after years of activism, we achieved marriage equality and gender recognition. Following these momentous gains, “what’s next for LGBT Ireland and what’s important to YOU“? Minister of State David Stanton TD officially launched the findings of the largest consultation of the LGBT community ever undertaken in Ireland on Wednesday, 29 June at 7pm in the Wood Quay Venue in Dublin City Council. Introduce hate crimes legislation to protect minority groups in Ireland as the prevention of bullying and violence is the key concern of the LGBT community. End the life-long blood donation ban on gay and bisexual men and ensure that all health services are LGBT inclusive and in particular mental health services. Integrate LGBT inclusion within the ministerial brief of the Minister for Regional Development, Rural Affairs, Arts and the Gaeltacht to ensure the needs of LGBT rural people are central to rural policy. More than 85% of LGBT people in rural areas do not have enough community supports or services or opportunities to socialise. Campaign for marriage equality in Northern Ireland. Introduce mandatory LGBT equality and awareness training for all public service providers in education, health, social care, elderly care and parental support services. Amend the Gender Recognition Act so it covers transgender young people and provides for the legal recognition of non-binary and intersex people. There are also a number of findings requiring LGBT community action in the areas of community development, regional support and alliance as well as through the celebration of gender and sexuality diversity. Olivia McEvoy, Chair of the National LGBT Federation, stated that “we have always known that recent legislative changes are only a platform for the culture we aspire to, where diversity is really championed and celebrated and where people can live authentic lives in dignity as their true selves. Burning Issues 2 now makes it crystal clear that we still have a long journey to travel before we end sexual and gender oppression in Ireland. While a number of additional specific and necessary legislative changes are mooted in the report, the required cultural shift will only be realised when the core principle of promoting sexuality and gender acceptance underpins all state policy and LGBT inclusion and equality become mainstream in all public service provision across education, health, parental support and social services. Moreover, it is particularly apparent that those on the margins need targeted support, especially transgender people, bisexuals and those who are LGBT and older, younger and living rurally”. The findings are contained in the ‘Burning Issues 2’ research report, which is based on a national survey of over 2600 LGBT people and 10 nation-wide focus groups in 7 cities and towns across the Republic of Ireland which was conducted in Spring 2016. In 2009, the National LGBT Federation (NXF) conducted a survey to find out what was really important to LGBT people in Ireland. This was the first time a survey had ever been conducted of LGBT people to identify the key priorities of the community. 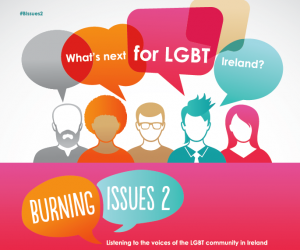 The research report, Burning Issues: Listening to the Voices of the LGBT Community in Ireland, provided an in-depth overview of the attitudes of LGBT Ireland that informed our work and the policy priorities of our community.